We are excited to announce the imminent arrival of SmileArts, the evolution of Smile for London. Visual arts, literature and music will collaborate to engage and inspire audiences both off and online. In the coming months we will be revealing our plans for the year and beyond. We LOVE London. That’s why we’re turning the cross track projection screens on the London Underground into a digital playground by exhibiting moving image by the best emerging and established artists around. Our aim is to unleash these creative minds to explore the medium of silent digital film whilst engaging, uplifting and inspiring commuters. 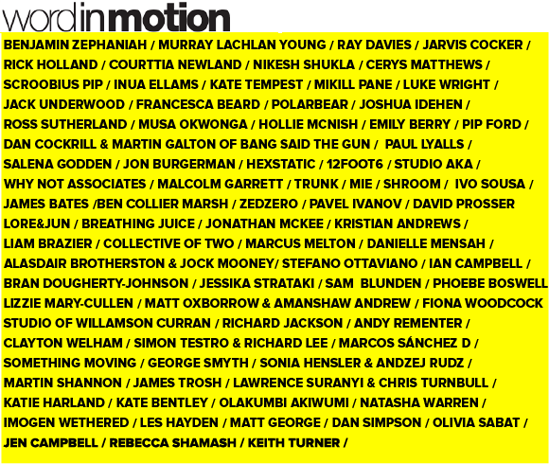 Following great support and feedback, we returned in January 2012 to proudly present Word in Motion, the exhibition that blends the world of literature with the world of art. Click HERE to find out more about the work that was viewed by 1.5 million commuters and included poetry and prose by Jarvis Cocker, Ray Davies and Cerys Matthews.